Desert Locusts: Nature’s marathon “flyers”? 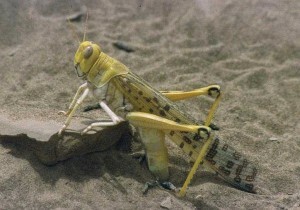 A desert locust in a wind tunnel test. Desert Locusts are capable of flying vast distances without spending much energy. This amazing feature of these creatures have been studied by scientists along the last decades. The answer to the question as to how do they do it is a bit tricky, but it is also very interesting to see how such a small animal can be so efficient.Factors that have to be considered vary from wing motion, metabolic rates and the amount of lift. 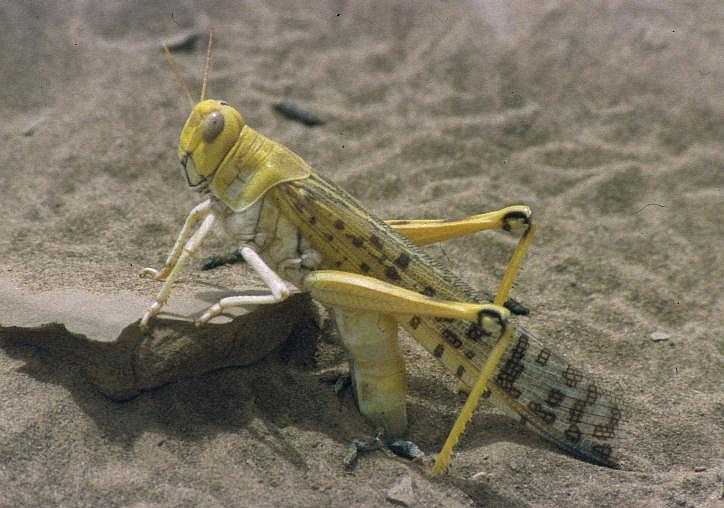 Locusts are not characterized for producing much thrust, therefore they also do not produce much lift, but they have the ability to maintain a steady flight rate which in normal flight conditions can be up to 1 to 3% of their metabolic rates. This is a remarkable feature these creatures have achieved because they have an evolutionary advantage that many other flying species do not have. This edge gives them the power to fly long distances without suffering from a costly energy expenditure. Locusts retain this incredible characteristic even when temperature and winds change, so this means that they are also impervious of losing this advantage if these conditions change abruptly. These remarkable creatures under always maintain the same flapping rate under any of the previously mentioned circumstances. Another great feature locusts have is that they twist their wings during flight to control and preserve the amount of lift that they produce, in this way the energy input used for flapping remains constant. This advantage is translated in their amazing capabilities to travel up to 80 kilometers per day. This edge lets them cover enormous portions of land, so they can feast on all plants along the way and leave behind them a fully deserted area. Their endurance and mobility is what permits them to be a major plague infestation problem. If it were not for this metabolic advantage these creatures would not be able to even survive because swarms of locusts need a lot of food and because they are so many, they deplete all resources fast. However, scientists were able to find a certain factor that altered their metabolic rates. This factor is lift; when locusts were tested at wind tunnels scientists observed that as locusts experienced higher lift demanding conditions , these creatures spent more energy. 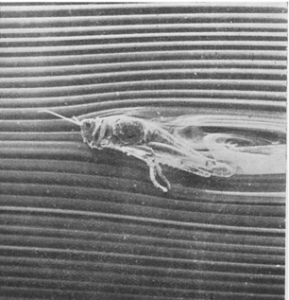 The question as to how these conditions were simulated in a wind tunnel has a simple solution, a downward wind is created to force the locust to produce more lift in order to remain airborne. The answer they came up to this problem was that locusts do not generate much thrust naturally, so if more lift has to be generated locusts will produce it, but also they experience more drag. In this particular case, locusts are forced to increase their metabolic rates, but this is a rare condition that is not likely to be experienced in their day to day flight conditions. To conclude, I would like to say that these creatures are remarkable and astonishing. They are the best adapted species when it comes to efficient flight. Although these animals are plagues and cause a lot of trouble, we should take them as an inspiration for alternative flight technologies that are better for our planet. Especially in these critical times where the quest for alternative energies that do not pollute the planet as much as oil. Truly remarkable article. I found your point about using desert locusts as inspiration for “new flight technologies” interesting, considering locusts have been such a nuisance to humans throughout history. 2) it varies the lift by twisting action! 4) however, the locust still uses little power to overcome this drag — 1 to 3%, according to your sources, if I understand correctly? How many wings do locusts have?